A roofing base sheet is the bottom waterproofing layer on a multilayer roofing membrane system. It is made of fiberglass or reinforced polyester, or composite reinforcement and is saturated/coated with modified bitumen asphalt. This is asphalt enhanced with plastic or rubber polymer. Base sheets are surfaced with heat-weldable film, sand or a release film depending on the application requirements. A low-slope roof will be covered with a minimum of two sheets: a base sheet and a cap sheet. 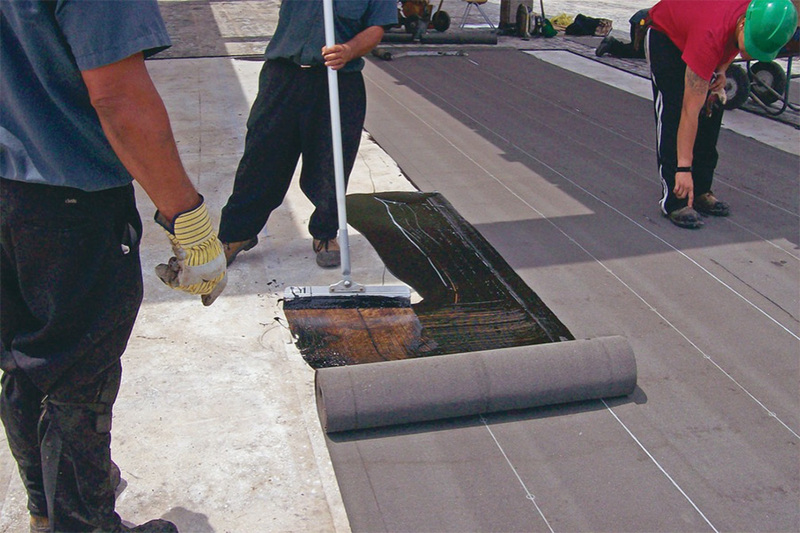 The base sheet provides waterproofing and a top surface that can bond with the cap sheet. The cap sheet provides colour, protection from fire, ultraviolet (UV) radiation protection and resistance to mechanical abuse. The base sheet and cap sheet must be designed to work together. Base sheets may sound simple, but there is a lot of variation among them, from the materials used to manufacture them, to their installation method. They may be part of a multi-ply built-up system involving many layers or part of a modified bitumen system with only two layers. In this guide, we’ll explain all of the types of base sheets and their respective systems’ components. We’ll also discuss base sheet installation methods. Built-Up Roofing (BUR): Built-up roofing systems have many layers so that if one layer develops a problem, the other layers offer redundancy. While these systems only have one base sheet, they will have multiple components. The base sheet in a BUR system can be made of felt, fiberglass or polyester. Base sheets in BUR systems can be impregnated with unmodified asphalt, or they may be impregnated with modified bitumen, a high-performance asphalt. IKO can provide guidelines for you to choose which base sheet is best for your application depending on the expected life of the roof. Modified Bitumen: Essentially, modified bitumen is asphalt with rubber or plastic polymers added. These polymers provide extra strength, flexibility and durability. There are two main types of modified bitumen sheets. SBS: Styrene-butadiene-styrene (SBS) is a rubber polymer that gives the base sheet extra elasticity, flexibility and durability. One such SBS base sheet is IKO’s Torchflex™ TF-95-SF-Base. SBS allows this fiberglass base sheet to remain flexible in colder weather, for ease of installation. It also improves moisture resistance and durability. APP: Atactic polypropylene (APP) is another rubber polymer used to give a base sheet extra durability and flexibility. It is also flexible at lower temperatures, enlarging the installation window for roofing contractors. If applied with heat, APP base sheets will need slightly higher temperatures than SBS base sheets. 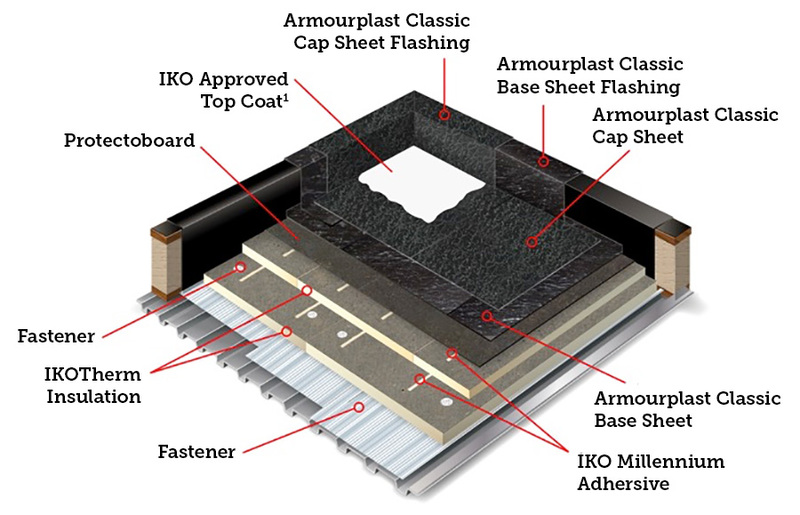 Armourplast™ Classic is IKO’s APP base sheet. Hybrid: IKO can supply hybrid bituminous systems that typically offer built-up roofing plies with a modified bitumen cap sheet. The specification requirements will dictate which products work best to achieve the desired performance. Properly applied hybrid systems offer outstanding weatherproofing. How are Base Sheets Made? IKO is committed to a high level of vertical integration, which means we control most of the materials that go into the production of our final products, ensuring exceptional quality control and materials compatibility. To manufacture our base sheets, we use a tough fiberglass nonwoven mat. We also modify our asphaltic compounds with either SBS or APP copolymers. After proper mixing, the bitumens are applied to the mat using exacting standards. 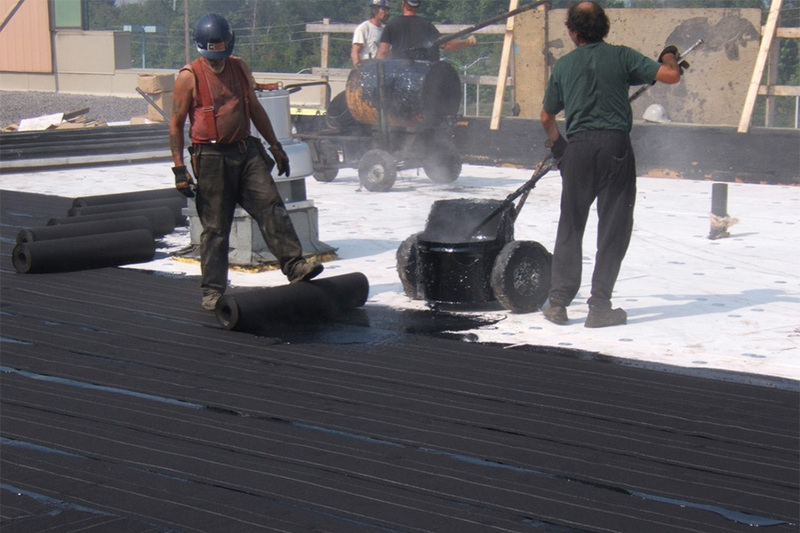 We saturate or coat the mat with the specific bitumen needed for the end product. During this process, we monitor the polymer blend, saturation levels and many other criteria with state-of-the-art equipment to ensure the finished product meets not only our high-quality standards, but specific ASTM, UL or other required standards. Every step of the manufacturing process is carefully controlled. Where Do You Install Base Sheets? Let’s discuss where the base sheet fits in among the different layers of the commercial low-slope roof system. Substrate: There are a number of structural roof deck types: steel decks, wood decks, concrete decks, lightweight insulating concrete decks and cementitious structural wood fiber decks. Vapour retarder: Consult a professional to determine if a vapour retarder is a necessary component for your roofing system. It can be an important addition to mitigate vapour transmission in the roofing assembly. A number of factors affect performance, and this can be a complex decision. Low-slope roof insulation: Insulation will help a roof keep conditioned air in the building, whether that’s keeping heat inside in winter or keeping it out in the summer. One of the best choices for achieving a high R-value is IKO’s polyiso insulation. The higher the R-value equals higher insulating efficiency. Overlay cover board: Cover boards are components that can add hail and other mechanical resistance to a well-engineered roofing system. Base sheet: Your deck type needs to be considered when selecting a base sheet. For example, a lightweight concrete or nailable deck may need a venting base sheet. Also, the application will be important such as if you are mechanically fastening the system, heat welding, using cold adhesive, hot mopping or using a self-adhered system. Cap sheet: Luckily, there is a full spectrum of cap sheets choices. The optimal selection will depend on a number of factors, including the building location, code compliance or cool roof requirements to be met. Hot Mopping: The hot-mopped system is a traditional method of applying bituminous base sheets. The resulting system is redundant and durable. These systems can be applied in a wide range of climate conditions, offering more choice for a greater year-round installation. On-site kettles or pumping equipment restrictions can be a drawback in urban areas. Heat-Welded: These systems utilize heat welding machines or propane welding equipment to melt the asphalt, creating an adhesive that bonds to the substrate. Safety is paramount when using these application methods. Self-Adhered: As the name implies, these bitumen products are manufactured with release liners to prevent the product from sticking to itself. They are becoming increasingly popular because they can work in buildings, such as hospitals, where low odor or low VOC materials are a requirement. They are also commonly called peel-and-stick products. Armourbond 180 is a self-adhering base sheet from IKO. 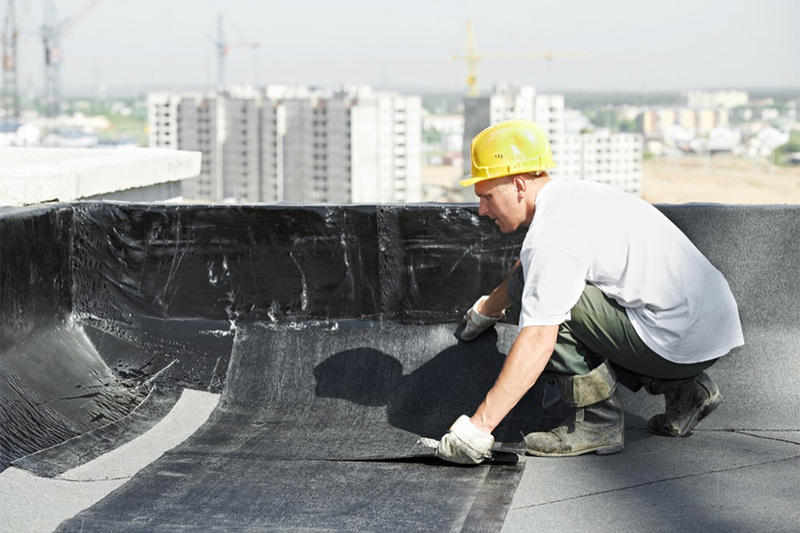 Self-adhered products are ideal to use on roofs with a number of penetrations, such as vents or HVAC equipment. Mechanically Fastened: Another option is to mechanically attach the base sheet. An example of this is the IKO Fast-N-Stick™ 180-Base Sheet, which is manufactured from a tough nonwoven reinforced polyester mat strengthened with fiberglass. It is a strong, “lay flat” base sheet. Mechanically fastened systems are ideal for large roofs where optimal production speeds are desirable. Cold-Applied: These adhesives are liquid at room temperatures and spread on with a trowel or squeegee. Then, the membrane is pressed onto the roof with a heavy roller. 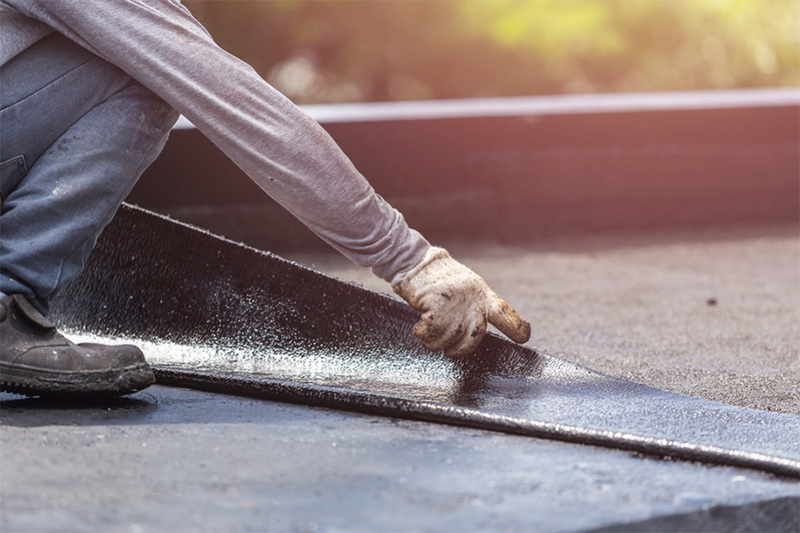 Cold-applied base sheets are a unique solution that provides the roof with excellent protection while saving the roofing professional from working with torches, mopping out melted asphalt or having to peel off release sheets. IKO’s Cold Gold™ is a cold-applied adhesive that can be used to secure our Modiflex™ base sheets. Code regulations such as wind resistance. LEED®, green roof, cool roof. A roofing professional can advise you on the benefits of one roofing system over another. Get in touch with an experienced roofing professional using IKO’s Contractor Locator tool. Or learn more about low-slope roof systems as a whole so that you can make a more informed choice.